One of the most appealing aspects of the land that Howard’s White Bear Lake, MN property is its abundance of towering trees. While they provide an abundance of shade in the summer months, they’re notorious for shedding piles of leaves once autumn arrives. The first time Howard reached out to our company, it was because he was interested in clog-free, seamless gutters. Delighted with all of the warranties, that accompany LeafGuard® Brand Gutters, he gave us the green light install them on his home. Pleased with that experience, he chose us as his roof replacement project. While we’re always pleased to hear from our 75,000 happy customers, the third project Howard reached out to us for was a storm restoration project. Both his gutters and his roof of less than three years had been so severely damage by hail that his insurance company had deemed them both in need of replacement. In need of expert advice, he turned to our team for guidance on which roofing material to install. Here’s how the roof looked upon completion. 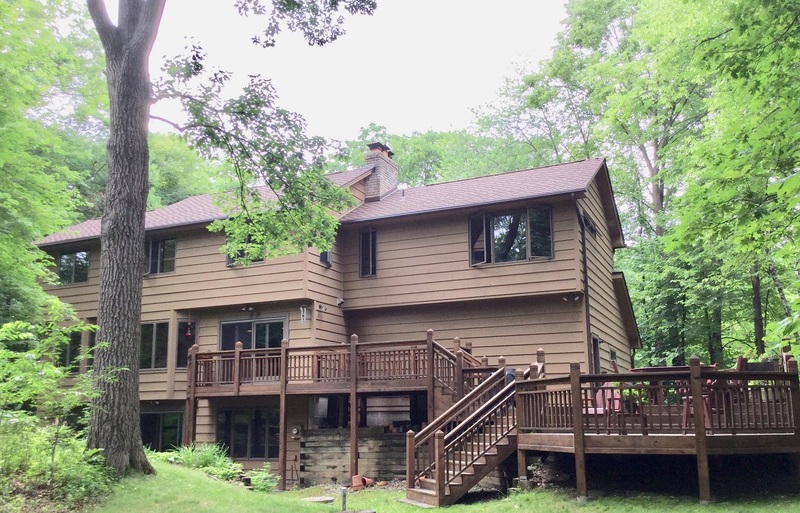 GAF Grand Sequoia® ArmorShield™: While storm damage to such new shingles was frustrating, it did provide an opportunity to explore the new innovations by GAF roofing. One such example was the GAF Grand Sequoia® ArmorShield™ shingle line. One of the biggest perks of this material is its durability. Due to its rubbery composition, the shingle has superior impact resistance, making it better able to withstand contact with hail. Even more appealing is that many insurance companies offer discounts to homeowners that opt to have the GAF Grand Sequoia® ArmorShield™ shingles installed. This is due to the fact that in impact resistance testing, it received the highest possible certification. This makes it much less likely to encounter damage from hail than ordinary shingles. From an aesthetics standpoint, the GAF Grand Sequoia® ArmorShield™ shingles win favor from homeowners because of their asymmetrical appearance which adds interest a property. They’re contoured in oversized craftsman shapes that offer a lap of luxury. Due to their rustic appearance, the shingles are offered in rich browns, gray and black. In order to highlight the roof as a point of architectural interest on the property, Howard opted for Mesa brown. This chestnut warm hue was the ideal complement to the rest of the home’s exterior. The architectural style of this home, coupled with the roof's sizable surface area made it imperative that an attractive, long-lasting shingle be used. Find out what our recommendation was! After hail destroyed his roof, James asked us for our recommendations of an asphalt roof that would have better impact resistance.